You see I've been sick since mid-day Saturday. Finally gave up and got a doctor's appointment today, because I really did feel rotten, and my boss would not have been happy if I didn't have an excuse and missed work tomorrow (which I will). The results? Some kind of bacterial thingy - probaby a sinus infection, but the nurse told me my temperature was 101.7. Wow. I had no idea, and I'd taken it, too, a couple of times...it wasn't nearly that high when I took it! We're making mini socks to wear and exchange at Sock Summit. I started with 3 stitches on each of the two size 0 circulars, then increased to 9 on each needle. Knit the toe, made the heel flap, picked up the gussets, knit the itsy, bitsy, teensy, weensy cuff and ended with three rows of k2p2 rib. 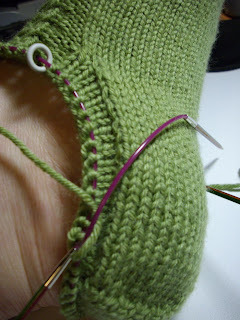 Somewhere on the cuff, I switched to dpns, as it was just a little bit easier. 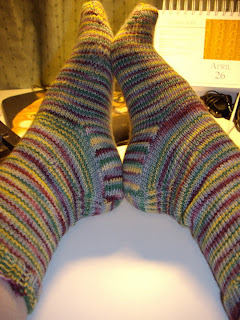 And the colorway is Hot Flash STR, of course. That's my cell phone for perspective. The Meezer is hoping I'll stop coughing so she can snuggle - right now, she's staying on the bed, at the very far corner, and only occasionally coming up to check on me...at least she's not running in the opposite direction! The doc said, "You saw those coming, didn't you?" I promised blocked shots of Boing! 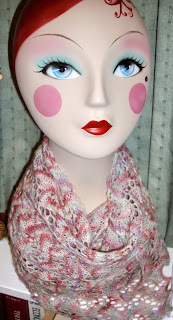 Here she is as a "little nothing" neck warmer - if you haven't checked out Anne's collection of these you really must, this was a delight to knit (even if it did take me awhile, it wasn't the pattern, it was me). 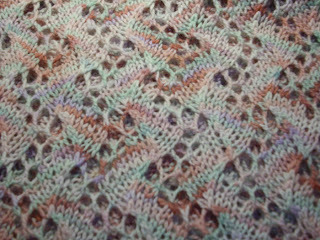 The yarn is a yummy Zen Yarn Garden merino. Very very soft...knit on my Harmony size 4, 16-inch circulars. I began this last May, 2008, and thanks to Rainy's Basket of Shame KAL, I finally got the motivation to complete it. But don't let that reflect on the pattern at all, I'm notoriously fickle. 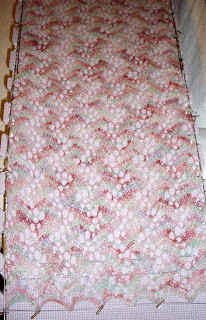 Finished size is approximately 51 inches x 12 inches (I did an extra repeat of the pattern). Hmm....now what to knit? What to knit? I know, Sock Summit Barn Raising Quilt blocks! The quilts will be raffled or auctioned off for Doctors Without Borders...and I've promised two squares. Gotta get busy as the deadline is June 9. 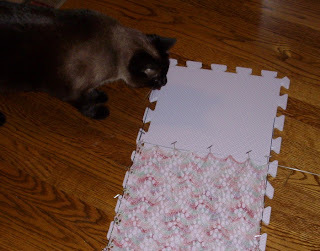 The Meezer had to check them out of course, and to make sure I did an adequate job (I wish she'd help with the pinning more, but after helping so well with my Highland Triangl Shawl she seems to have lost interest in the actual blocking and be much more involved in overseeing the final pinning - dear heaven I have raised an Executive Director Siamese...! Mom, What are these boingy wires? This is fun! I made a hasty decision to slip the folded cutting board under the blocks and move the entire thing into the office to rest on the chair. I'll show you the finished product with specs tomorrow after she's dry! I guess the pollen's finally got me good. So I'm going to make this a quick post, and probaby head off to bed early. (It's been upper 80s to 90 today, which is just plain crazy in April - especially since it was in the 40s in the morning just a couple of days ago - and you know me, I don't like these ups and downs one bit). The fellow who ordered this Oressa wanted it for crochet hooks, so I made the pockets much smaller, which made a lot more of them! And here it is rolled up. 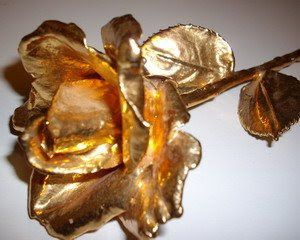 (But then, the spring and summer issues rarely call to me much) Will I make this? Who knows? I have a list of sweaters longer than my city block and none of them have made it to the needles yet! Thursday? Where'd the Week GO? But wow, it's been a whirlwind week! And today seemed crazier than usual with two meetings - one a regular staff type, and then the second for an upcoming fundraiser. It makes me nuts, but I can't take my knitting into those meetings...(sigh) It is verboten. And apparently feeling kinder towards me, as she looked INTO the camera, however briefly! And believe it or not, I knit a bit tonight...I was too tired to do much else, so a few minutes on Boing! while I watched Rachel Maddow...I'm in the middle of repeat 19 of 21!! Whoohoo the end is in sight! I'm so glad for the Basket of Shame KAL - that will be two of my four items and I just might finish it before April is done! even if it IS Earth Day and all. Hope you're working on different things you can do to save the planet? Each one of us can do just one more small thing than we're doing now...right? The ceramic bank was getting heavy, so I decided last night to see if I had enough of anything to roll up and get into the REAL bank for even the pittance of interest that might be had there...better to have them pay me pennies, than have it sit and earn nothing! This is what it looked like after I'd sorted into piles. Yes, that's $28.50 (and a start on the next rolls). Umm...That's at least a skein of handdyed sock yarn at Sock Summit 2009! And all from the change in my purse most days (I don't shop every day, but I've gone to carrying and using cash a bit more often so there's change to put in the ceramic bank). And by the way? 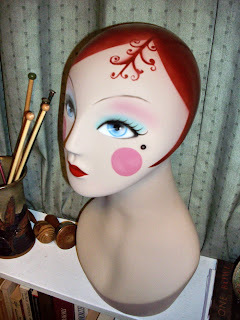 I'd forgotten that coinage is filthy - my hands were almost black when I finished this! When she balanced her checkbook every month, the difference between what she said she had and what the bank said? Got swept into her savings account. 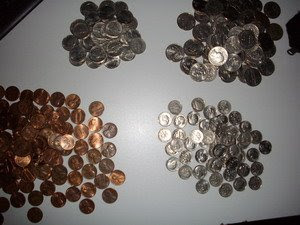 But clearing out the pocketbook of change everyday is useful, especially for small special savings goals like Sock Summit. What tricks do you use to help you save? I've learned that Kay's husband died. 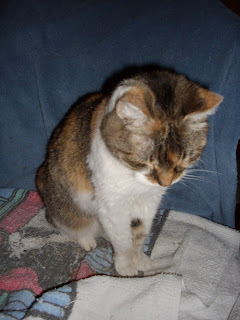 I'm sure you'll join me in extending prayers and sorrow, and knitterly (((((Hugs))))) her way? For all your kind and lovely comments on the Sundry Cases. I appreciate them! 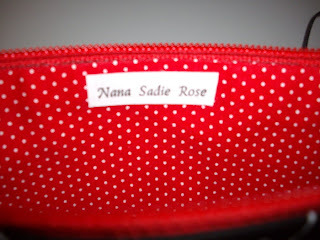 I'll tell you this: anyone who wants to make Nana Sadie Rose a line-item in their budget? I'm delighted to oblige. lolol! For those who say that they "can't do zippers?" Well, so did I. I guess practice, practice, practice is my best advice...(and practice on things that don't matter). And realize that NONE of us is perfect. We do the best we can. We are not machines (whew!). As such, anyone who purchases a handcrafted item knows going in there will be variations and idiosyncracies that make my products (and yours) endearing and special. (This is another way of saying that I am one who ascribes to the Amish Error theory...I can't, and won't, make anything that's perfection - there must be space for the divine to leave my work - an Amish Error). However, if you choose not to look for it? So much the better! *wink* And know that I will, to the best of my ability create a product for you that has the greatest attention to detail that I can possibly provide...because I love what I do! 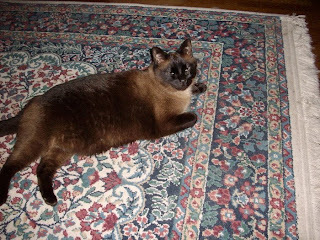 Nana Sadie Rose seldom rests...I have ideas perking away day and night: most of them flop. For some time, I thought that there should be a redesign of one or two bags, even if only slightly, and those are in process. I'm not going to talk about them tonight. Just stay tuned, okay? 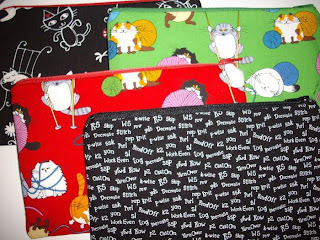 No cute name this time, but you will be able to find them as Sundry Cases when they finally get up on the website! The first ones will be available at Sedalia (see the ticker up there? Not all that far off!) 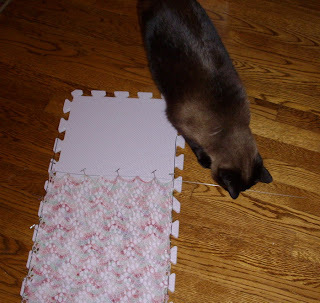 These are some of the mostly knitting related fabrics (ok, I had to include kitties, too). These little zippered bags are good for stowing all the little stuff you carry in whatever bag you carry (cosmetics, knitting/crochet items, bandaids? )...they're a nice size, approximately 7.5 inches wide by 5 inches high, and the insides are fully lined with a coordinating fabric. 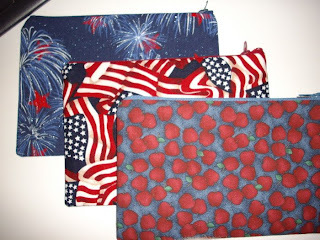 I like these patriotic and country fabrics a lot, so you'll find them often on my pages! 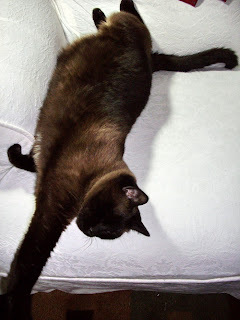 And I do my level best to properly match my stripes! Couldn't resist these. I'll be sewing away on more of these. 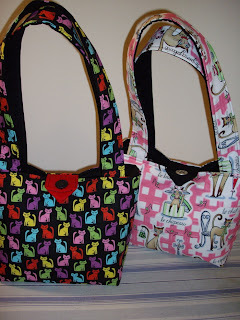 Obviously when you buy a Nana Sadie Rose bag, you can ask to have a Sundry Case created to match or coordinate with it (depending on the fabric, of course). If you'd like me to create one for you, just email me, okay? Eventually I'll have some in the Etsy store, too. I finally heard from the friend who disappeared, she's been ill, the requisite phone call from the family members to me was forgotten. Hopefully, we'll rectify that for the future. And I have new contact phones for her folks, so if no one changes their numbers, we'll be fine! I finally have my own copy of Wendy's book. No thanks to Amazon.com, but I'll postpone my rant on that for a minute. Here's the happy-making thing: You MUST get this book if you're a toe-up sock knitter. Even if you're not. If you want to be a toe-up sock knitter! 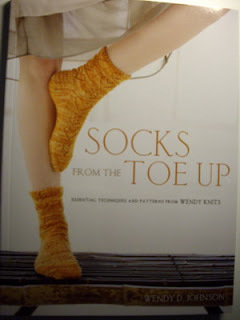 If you just thought it might be interesting to try toe-up socks, you need this book! I love this book, I will probably make every pattern in this book at some point or another, and, believe it or not? There are TWO, count 'em, TWO heart-patterned socks in here...Whee! I will be linking to them from now on. I'll try to explain. I pre-ordered Wendy's book back in February. Amazon told me on Sunday that this book had shipped and would arrive on Wednesday. It didn't. In fact, all week it hasn't even been picked up on the USPS radar (other than the "Amazon told us they're going to be shipping this but we haven't received it yet"). It's sitting somewhere in Amazon's warehouse. But I got a canned reply to my complaint to Amazon, telling me to wait until the 24th before they did anything about it. This wasn't the first time I've had serious problems with shipping from Amazon.com. But it was the last time. Fortunately, I discovered that my local bookseller had gotten the book in and I cancelled the order at Amazon and bought the book locally. You see, I *heart* Wendy. But then, that's because she taught me to knit socks, courtesy of her blog (among many other things, including her support of my work, too). And she clued me in to Judy's Magic Cast On, which you all know I swear by. I am a fan. Of Wendy. Of Judy. Of Chris. And now, of IndieBound. Tonight, I reconnected an old friendship that should never have gotten lost in hard feelings...I misinterpreted a comment during an emotional exchange, and that error caused me and my friend an inordinate amount of pain and too many months (years!) of silence between us. Over the past couple of weeks, we've been emailing again, working towards a meeting that would, we both hoped, begin a healing that was long, long overdue. Dinner tonight was wine and Indian food, and catching-up conversation. And big hugs. Life is simply too short to allow such absences to occur. I think she and I will be fine now. And for that I'm breathing a huge sigh of relief. And casting grateful prayers skyward. I came home to blog comments from two relatively new friends from the other side of the country, both talking about meeting up in August at Sock Summit so we can finally hug in reality, not just the virtual world that has nurtured the beginnings of our friendships. It brought me to tears, on the heels of the evening just closing...what a wealth of female friendship surrounds me! But there's still one missing friend that is causing me much concern. A long-time "sister-from-another-mother" that for some reason has been silent for the past two months. If that friend is reading, if I've done something to hurt you, I'm sorry and hope we can talk soon. I wish I knew why there's been no contact, in spite of my attempts to do so. I surely didn't mean to make folks think that I wanted to be anything else but like my mom when I wrote up the Ten on Tuesday yesterday...not the case. Still...she had a lot of folks fooled, and I should look as good as she did at 80! 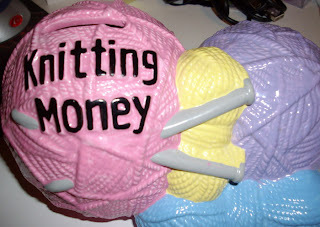 This bank was a holiday gift from the first year's exchange at the Roanoke Valley Knitter's and Spinners group. I was delighted. What better way to set a goal than to have a repository for each step you take towards it...(at least when it's a monetary one...) - especially if whenever you look at it it makes you smile? 1. Everyone you speak to on the phone who is under 30 sounds as if they are really only 12 years old. Did I ever sound like a child? 2. 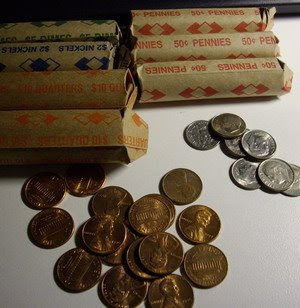 No one knows how to make change anymore - counting back change from a $20 for an item that cost $12.76? 4. Males of the species no longer do a double-take when I walk by. Of course, that could be as much because I can no longer wear high heels and refuse to wear skirts, as that "age thing." 6. Rolling the trash can to the curb is my aerobic exercise for the week. 7. The number of times I say to anyone younger, "In my day..."
9. Looking into my handbag to find...everything my mother always carried, "Just in case!" 10. Knowing when the weather is about to change based on my aches and sinuses! I spent the day mostly indoors (as every good Lupie does), but had to work, of course - on the client's books. I did manage to venture out a couple of times, so I got to enjoy a little of the weather. I also had a woodpecker knocking away above my head, just outside my office window. I suspect he won't knock long, if my landlord has anything to say about it! Boing! indeed. 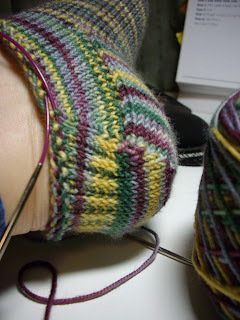 I'd love to see this little item finished off in the next couple of months (in between socks, of course). 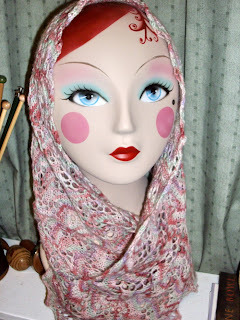 But it's a pretty little pattern, and the yarn is squishy soft! Your rainbow is strongly shaded indigo. 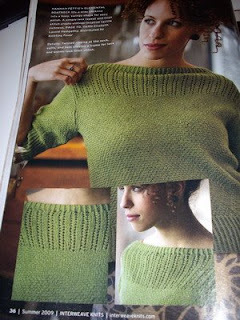 So I wonder why it is I'm knitting so very much that's green these days? And you really could add in a bit of pink and fushia to make me really happy. Oh well, that's a quiz for you! But as I was listening to Keith Olbermann's interview with Nancy Pelosi, I stopped working on the stockinette sock, and idly picked up the catalog. I was in pretty good shape as I flipped pages. City Tweed, to be exact. Dk and worsted weight coming the end of April. 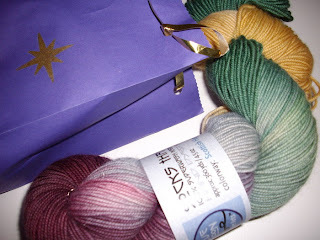 In colors that, if true to the catalog photo, make me drool...purples, plums, grays, a blue that rivals my favorite Jo Sharp DK Silkroad Tweed (called Boheme it's what I used to make my Highland Triangle shawl), then also ivory and caramel. 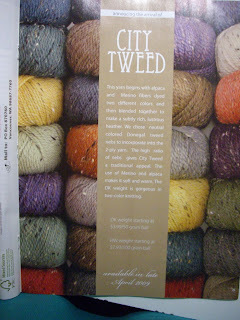 IF this new KP's City Tweed is as lovely as the photo? I'm in serious, serious trouble. 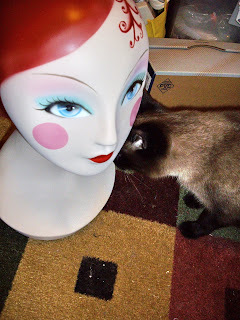 Mommie, the first step is to admit you have a problem...let me help? You are addicted to yarn...ADDICTED, do you hear me? Please seek help? Or at least let me nest in it? Voting for a friend's friend's design? It's so pretty! 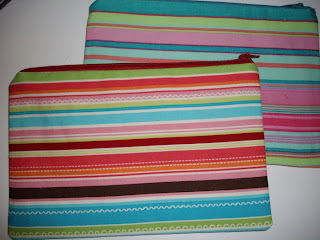 In the Reusable Shopping Tote for Kroger design contest you can vote daily! It's all socks, all the time, these days in Knitnana-ville! I turned the heel at the show this weekend and I love the way the slip stitch heel looks in the striping of the yarn, don't you? 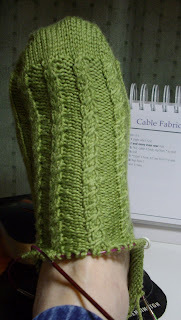 Now to decide just when to stop knitting the gusset and when to start the cabling on the cuff. I do know there's precious little yardage in each ball of this, so they may not be very tall cuffs! Anyway, this seems to be all the brain can endure right now. Better to knit mindlessly and recover from the weekend! By the way. 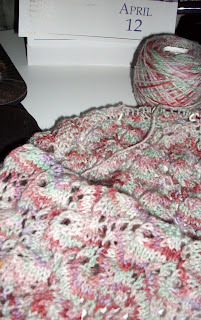 Does anyone notice anything odd about my current knitting projects? Odd for Knitnana at least? What I Did On My Weekend In Charlotte NC! 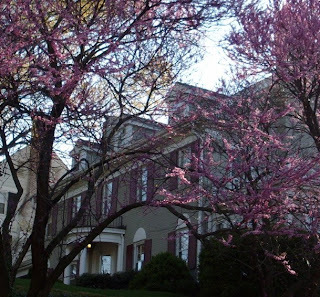 Charlotte is certainly beautiful in the springtime! We had a really good trip - the hotel was nice, we had a couple of really good dinners, had fun spending time with our friends, Pat & Chuck from The Cat's Closet. The showhall was a decently sized one, and I was delighted that driving into the hall to unload and then load up again was permissable. It's not always the case in different venues, but it surely saves the strain on my back! We got the booth set up fairly quickly but had to improvise a couple of things because I forgot certain critical items (the feet for the curtain/backdrop, a couple of the sheers we've used in the past for curtains, that sort of thing!). Actually what we improvised worked better, so I'll be making improvements in the booth setup as a result...it's always a learning process. Saturday was fairly busy, and we met a lot of new people. But Sunday, which I realized too late was Palm Sunday, was really very slow. All in all, with everything considered I'm glad we went especially because we made a lot of new acquaintances for Nana Sadie Rose. In light of the economic environment, we probably did reasonably well for a two-day show. Will we go back? Yes, probably, but we'll wait till the economy improves! I was completely blown out of the water when someone walked into the booth, looked up at the banner and said, "I've seen you on the internet!" It seems that she was doing a search on cat fabrics and found me. 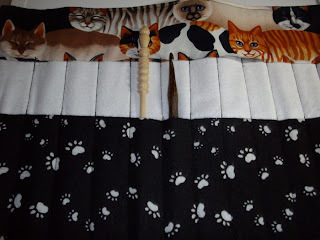 That is always a delightful surprise, as I wonder how many folks out there are searching on terms I would not put together (okay, yes, cat fabric really isn't an unusual stretch for my items, I realize). Still it's fun to hear I'm being "found" without prior prodding! As usual in my trips to North Carolina, it was impossible to escape without at least one missed exit, and we spent a couple of times going way out of our way, or even deciding last night that since we'd missed the exit to get onto I-77 and were about 10 minutes along when we realized there wasn't a good way to turn around, we headed home via Greensboro (where I've never yet managed to find my way smoothly to Rt 220 North). What is it with North Carolina road signage anyway? 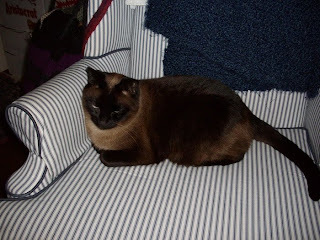 The Meezer, I see, let you know how put out she was by my leaving, and apparently the "good vibes" she originally had with the new sitter, faded into the ether once I was gone. The sitter never saw her the entire weekend, but she immediately slithered into the room, looking left and right, low to the ground when I walked thru the door. 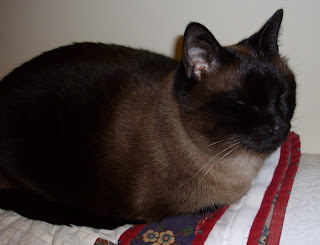 A very happy Siamese snoozed the night away right next to me. All is now forgiven, but she was certain to let me know how unhappy she was to be left alone. CC looks better than when I left. Not sure why, but I'm not complaining! I'm very glad to be home, glad to have made new friends, and also delighted that the Bernina is in the shop for annual maintenance for a few days to a week or so. I think I need a bit of a break! CC isn't a lot of fun...she sits up once in awhile, but falls asleep as she sits there, unless I'm pestering her. She growls and hisses then. No fun at all. I'll show Mommie. I've taken over her chair. I'll leave lots of cat fur on it. It's right here by the door and I'll know as soon as she gets back. Or as soon as that nice lady comes back to feed us. Why does Mommie go away? Doesn't she know the best is right here waiting for her? I finished work about 8:30 tonight (what with the business client and all). If it could go wrong, it did. I'm not sure, but I'm hopeful that as the sun begins to poke from behind the clouds tomorrow, the little black cloud of craziness that's been hovering over me the past couple of days will disintegrate. Keep your fingers crossed for me, okay? (Today? Involved a broken printer - thank heavens the paychecks for the vet were done, but there were reports and such to finish, so I worked from home tonight). Everything is packed. I finished these two Kerris last night. Aren't they cute? I've always loved Michelle Meow (in the back) and this little rainbow cats print is fun, especially with the red contrast! 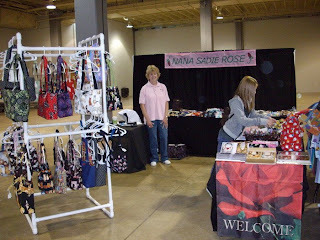 If you're in Charlotte, NC over the weekend, please stop by the Merchandise Mart? We'll have a great time at the Crafty Cat Show. Is It ONLY Wednesday? Well...Surprise! Yes, it was "one of those days" several times over today...(Is Sock Summit soon? I need a vacay so very very badly!). I was all over the place, never a dull moment, phone calls, errands, worried nerves needing calming (mine, especially! ), and just generally a day with no space to breathe, or even think very much. And certainly I didn't get to pick up the needles till I sat down in the waiting room to get the oil changed in the Forester tonight! 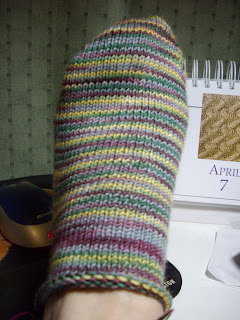 And I didn't even get an entire pattern repeat done on those socks! They were that fast (whew, one more thing off the pre-trip list). But it was there, in the quick lube place, that I suddenly thought, "I'd forget my head if it weren't attached!" The Meezer isn't so sure what to make of her, she didn't get very close, just sniffed a couple of times and gave her a wide berth otherwise! The box arrived at the office today and I couldn't imagine what was inside...I squeeled when I opened it and saw her! 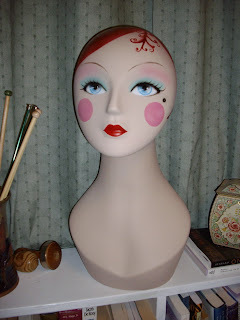 I've visited Karen's blog and seen her's, mentioned it to her a time or two, looked at them on ebay, drooled but not bought, thinking that one day I'd get one, but not right now. Then the whole world went crazy and I raced and scrambled thru the day, desperately trying to put out fires (I HATE days like that!) while also trying to do the normal end-of-month tasks, too. Sometimes I think I need a second head, you know? Karen asked me what I was going to name her, and I said, "Well, that's easy! 'Karen!' - so that everytime I look at her, I'll remember you!"